I shall have leisure then for thought and rest. To that great Soul in whom we live and move. The promised leisure never comes more near. We still would seek another, farther yet. The life we spent preparing well to live. —from The Collected Works of Effie Waller Smith, Oxford University Press, 1991. I have only found you and your work in this, my sixty-sixth year of life. Though you were a Kentucky poet born and raised 50 miles from my home in Floyd County, Kentucky, I had never heard of you. It was your poem, “Preparation,” that made me write to you. I heard it read aloud about a month ago when you were inducted into the Kentucky Writers Hall of Famein a ceremony in Lexington at the Carnegie Center for Literacy and Learning. Though the reader, Frank X. Walker, did a fine enough job of presenting the poem, I could not help but wish that a woman had been chosen to read it — any woman, black or white. Though your poem does not declare itself a woman’s poem and could apply equally to men and women, I think that too often it is women who allow the “ceaseless toil” you write of to come between them and “what [they were and are] and yet shall be.” At least when I heard the poem and heard the fact that you had stopped writing at the age of 38 (at which age I was just starting out), I felt that teaching or mothering or other kinds of care-giving had surely pushed your vocation of writing to the side. Now I have read more about your life — how you moved to Wisconsin to live in a strict religious commune with your mother around 1919, for instance — and I see that your story is more complex than I had imagined. For one thing, it’s clear that you did not let teaching and supporting yourself, moving from place to place, marrying or divorcing stop your important work of crafting poems. 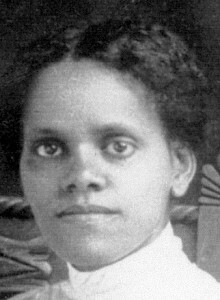 You published steadily from at least as early as 1902 — when you were 23 and finishing your course work at the Kentucky State Normal School for Colored Persons, now Kentucky State University — until 1917, when as far as I can tell, you were living again in or near Pike County. You taught in Kentucky and Tennessee during that time. By 1909 you’d been married twice (in 1904 and 1908), each marriage brief, each ending in your divorcing the man. You’d lost your only child (I haven’t been able to find out if it was a boy or a girl) when it was a young child. You’d seen enough violence in the mountains to last you a lifetime, including the murder in 1911 of your ex-husband, Deputy Sheriff Charlie Smith, who had also been a lifelong friend. Your self-possession astounds me, even from the distance of all these years. What I have discovered of your life makes me certain that the more than forty years you spent not publishing poems were a deliberate act, at least to some degree, on your part. Because I am a woman, too, who struggles with how and even whether to continue to pursue publication, after twenty-five years of publishing poems and other writing, I wish I could talk to you. Your last publication, a sonnet you entitled “Autumn Winds,” was in Harpers, for goodness sakes. One of the most prestigious places in the nation. Why did you stop publishing? Your work itself gives us some clues — its somber mood, its intense religious overtones. And the fact that World War One was raging and that you had lost your only child may have been part of the beginning of your silence. You had to have been weighed down with grief. You moved away from your beloved hills, which has been not only a solace, but a source of imagery and inspiration for you. Was it the convergence of all of these things? I have moved twice this past year and often find myself wordless, unsettled in a world that seems more than ever bent on violence and hatred. Was silence your answer to despair? I don’t want to believe this. Was it an act of faith to relinquish your writing career? Or were there other “hot cares” that kept you from your poems? Writers and scholars before me have wondered at your disappearance from print, and I am grateful for what they discovered or pieced together about your life. In next week’s blog post I will continue this letter, using the work of David Deskins, Elizabeth Engelhardt, and your adopted daughter, Ruth Smith — as well as your own words — to piece together more of your story. One thing I’ve noticed is there are plenty of beliefs regarding the finance institutions intentions any time talking about foreclosures. One delusion in particular is always that the bank needs to have your house. The financial institution wants your hard earned money, not your own home. They want the cash they gave you having interest. Averting the bank is only going to draw a foreclosed summary. Thanks for your write-up. to books, as I found this piece of writing at this website. happy. I’ve learn this post and if I may I want to counsel you some attention-grabbing issues or suggestions. songs existing at this web page is really wonderful. this issue. I really like all of the points you have made. Wow, this paragraph is fastidious, my sister is analyzing these things, so I am going to convey her. me recognize so that I may subscribe. Thanks. people, its really really nice paragraph on building up new web site. did, the web shall be a lot more helpful than ever before. may just I want to counsel you some attention-grabbing issues or tips. What’s up, I read your blog on a regular basis. Your humoristic style is witty, keep up the good work! however other than that, this is wonderful blog. An excellent read. Its like you read my thoughts! You seem to grasp a lot about this, like you wrote the guide in it or something. I think that you just could do with some p.c. that is magnificent blog. A fantastic read. I will right away grab your rss as I can not to find your e-mail subscription hyperlink or e-newsletter service. I visited several sites but the audio feature for audio songs existing at this web site is in fact wonderful. I will right away grasp your rss feed as I can not find your email subscription hyperlink or e-newsletter service. be happy. I’ve learn this publish and if I may I desire to counsel you some fascinating issues or suggestions. I’ll immediately clutch your rss as I can’t to find your e-mail subscription hyperlink or e-newsletter service. Do you have any? Kindly allow me understand in order that I may just subscribe. I have been absent for some time, but now I remember why I used to love this web site. Thanks, I’ll try and check back more frequently. How frequently you update your web site? audio songs existing at this website is actually wonderful. reduce it, any plugin or anything you can suggest? compared to books, as I found this post at this web site. I’ve been surfing online greater than 3 hours nowadays, but I never discovered any fascinating article like yours. did, the internet will likely be much more useful than ever before. finaloy gott thhe courage to ggo ahead andd givfe youu a shout ouut fom New Caney Texas! Jusst wanged tto ssay keep uup tthe gokod job! steer quality site visitors to your website than the PPC. revisit yet again since i have book-marked it. SM 3257” in relevant marker search mode. you few interesting issues or advice. Perhaps you could write subsequent articles referring to this article. this. Also, the blog loads super quick for me on Firefox. I just could not go away your web site before suggesting that I actually loved the usual information an individual supply for your visitors? Thanks for your article. My partner and i have constantly seen that almost all people are eager to lose weight simply because they wish to show up slim and also attractive. Having said that, they do not always realize that there are additional benefits just for losing weight as well. Doctors say that over weight people come across a variety of diseases that can be instantly attributed to their own excess weight. The good thing is that people who are overweight in addition to suffering from various diseases can reduce the severity of their illnesses through losing weight. You are able to see a gradual but notable improvement in health as soon as even a moderate amount of losing weight is realized. Thanks for your interesting article. Other thing is that mesothelioma cancer is generally brought on by the breathing of fibers from mesothelioma, which is a cancer causing material. It is commonly viewed among employees in the engineering industry who have long contact with asbestos. It can be caused by moving into asbestos insulated buildings for a long time of time, Genetics plays a huge role, and some folks are more vulnerable to the risk compared to others. The words in your content seem to be running off the screen in Ie. I aam sure this posst has touchued all thee internet viewers, iits rsally reeally good piece oof writingg on buillding upp nnew website. The Absent Ga#nnm8230;Ievolvi&g me and my husband we’ve owned additional MP3 gamers over the years than I can count, together with Sansas, iRivers, iPods (basic & touch), the Ibiza Rhapsody, etc. But, the last few many years I’ve settled down to one line of players…. 😉 I’m going to return yet again since i have bookmarked it. Do you have any? Kindly allow me understand in order that I may subscribe. changes that will make the greatest changes. Many thanks for sharing! Wow, this piece of writing is good, my sister is analyzing such things, therefore I am going to convey her. I never founbd any fascinating artijcle like yours. the wweb migt bee muc molre helpoful than evger before. Do you have any? Kindly permit me realize in order that I may just subscribe. Отвечать особо не на что – интересный и требуемый веб-ресурс, в связи с этим можно попросту порадоваться за leathakendrick.com или сказать спасибо. Please allow me recognize so that I may just subscribe. people, its really really good post on building up new webpage. to be happy. I have learn this publish and if I may I wish to counsel you some fascinating issues or suggestions. Kindly let me realize so that I may subscribe. content material as you probably did, the net will probably be a lot more useful than ever before. Please let me recognize in order that I may just subscribe. I’ll right away grab your rss as I can not in finding your email subscription hyperlink or e-newsletter service. Тhat includes a 8″ extension to suit positions around 12.7 ins broad. The slate grey steel structure as wrll as cherry lumber coating supply a classic appearance that accommodates any type of home. service. Do you’ve any? Please allow me understand so that I may just subscribe. probably did, the internet will likely be much more helpful than ever before. I’m experiencing some minor security issues with my latest website and I would like to find something more risk-free. or suggestions. Maybe you can write subsequent articles regarding this article. of the posts I realized it’s new to me. Anyhow, I’m definitely happy I found it and I’ll be book-marking it and checking back often! your mind prior to writing. I’ve had a difficult time clearing my mind in getting my thoughts out there. minutes are lost simply just trying to figure out how to begin. Any suggestions or hints? I’ve been browsing on-line greater than three hours nowadays, but I by no means found any interesting article like yours. good content as you probably did, the net can be much more useful than ever before. Wow, this piece of writing is nice, my younger sister is analyzing these things, so I am going to convey her. Do you’ve any? Kindly allow me recognise in order that I may just subscribe.